Well, I have been following Jenny at Picky Palate for awhile now because her recipes looks SO delicious! I finally tried her Romano Ranch Chicken & Rice Skillet & it was FANTASTIC! 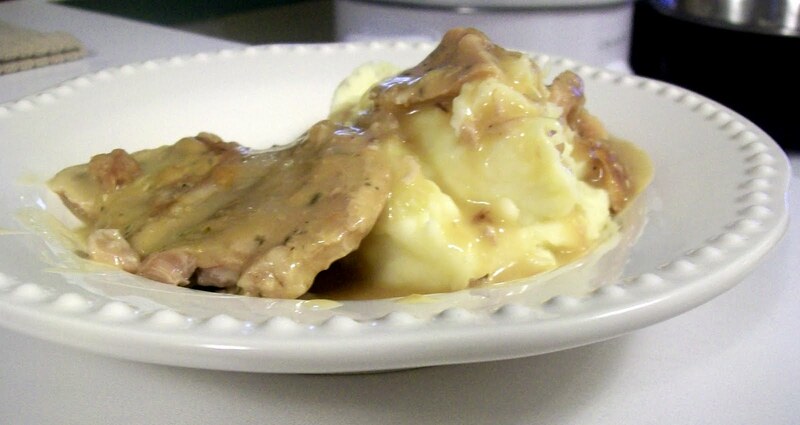 So today i tried her crockpot pork chops with parmesan mashed potatoes. A BIG HIT! Seriously, it was DELISH! I usually don't do the best mashed potatoes - i know they are easy, but for whatever reason, mine are not that great. But these were the best! The pork chops were SUPER easy & turned out sooo tender & yum! Definitely will be making this dish again!! 1. Place pork chops in crock pot. Sprinkle ranch dressing over them & top with cream of chicken soup. Cover & cook on low for 6 hours or high for 4 hours. 2. Place potatoes into a large pot of cold water. Place onto stovetop over high heat and bring to a boil. Once water is boiling, cook for 10-12 minutes or until potatoes are fork tender. Drain and transfer to a bowl. Mix with an electric mixer on low until potatoes are mashed. Then add butter, parmesan, garlic, milk, salt and pepper. Season to taste if needed. For thinner mashed potatoes add more milk, slowly until your desired consistency. Side note: I usually use fresh garlic but towards the end of cooking today i just didn't feel like cooking all of a sudden. So i cheated & used garlic salt instead. It was still absolutely delicious. I love garlic, so i'm sure it'd be fantastic with the roasted garlic. But i'll have to try that next time. Also, i had 7 chops, not 6, and would use a little more Cream of Chicken soup. It was absolutely WONDERFUL, just could have used more gravy! I had never used a mixer before to mash my potatoes... what a great idea! HA! Oh my word. That sounds so good! I'm also a big fan of garlic. I'm going to have to try this! how i love mashed potatoes! i prob owe a layer of fat to mashed potatoes. hmmm. Really going to have to try this recipe! How yummy! I am ready for dinner. Yum!! Looks like a good comfort food recipe! Might have to keep that on file, I like pork and I LOVE me some garlic mashed potatos. Garlic anything really. YUMM! These were delicious. I had originally planned to cook cubed steak tonight, but when I read this recipe this morning I couldn't resist trying it instead (since I already had ALL of the ingredients to prepare it!). Thanks for sharing! I make awesome baked pork chops, but I've never tried them in the crockpot. I'm going to add this recipe to my favorites and give it a try next week. Yum!!! thanks for sharing!